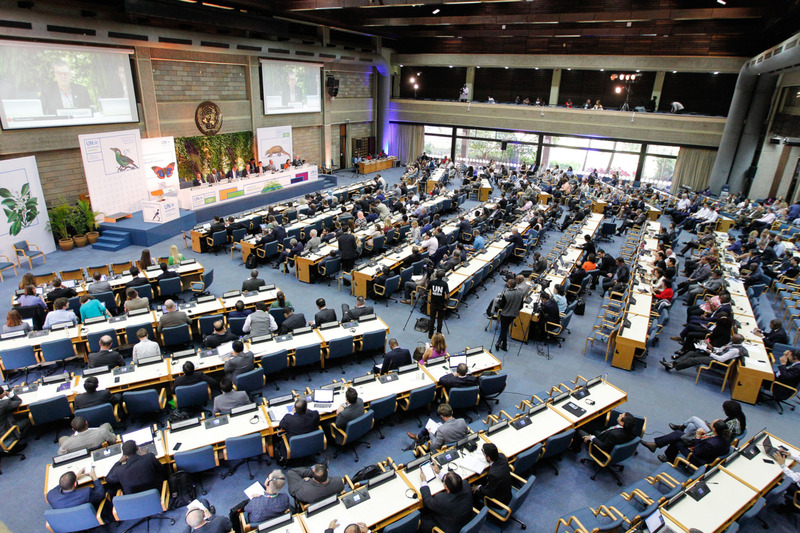 Plenary of the third UN Environment Assembly, 2017. While there is no designated international forum for addressing conflict and the environment, the Assembly has dealt with resolutions on the theme. Credit: Cyril Villemain/UN Environment. The environment has been the victim of conflicts since ancient times, and the religious teachings that once sought to minimise harm have now been superseded by a diverse patchwork of laws and policies. Technological and industrial developments in how wars are fought, and the emergence of the global environment movement, led to the first attempt to provide a measure of protection under international humanitarian law in the 1970s.1 However by the 1990s, these measures were already proving insufficient to address the potential for serious harm posed by modern forms of warfare. From 2000 onwards, developments in understanding over the environmental drivers and consequences of armed conflict have underpinned efforts to enhance legal protection for the environment before, during and after armed conflicts. They are also helping to inform new domestic and international security policies aimed at preventing or providing early warning of conflicts, and for building sustainable peace. The breadth of “conflict and the environment” has led to a range of parallel legal and policy initiatives being developed, on themes such as climate security, water, biodiversity, pollution, human rights and on ways to enhance the legal framework itself. Work to address the environmental dimensions of conflicts in international law and UN fora has accelerated noticeably since 2000. While responses to particular conflicts have driven some initiatives, the primary driver appears to be the expansion of understanding, and growing acceptance, of the role of the environment throughout the cycle of conflicts. Efforts to facilitate these processes have been driven by states, international organisations, legal experts, NGOs and think tanks. However coordination between those involved on thematic work in different fora remains limited. The ICRC is expected to publish a revised version of its environmental guidelines for military manuals in early 2018. Its 1992 guidelines were not enthusiastically welcomed by states so their reception may be a useful barometer for changes in how the importance of environmental protection during conflict is now perceived. The International Law Commission has now proposed 18 draft principles covering standards that should be adopted before, during and after armed conflicts.1 In 2017, a new Special Rapporteur was elected with a mandate to consider a number of additional topics.2 Supportive states have suggested that the draft principles be adopted in 2021 but the question of whether draft principles alone would substantively increase the protection of the environment in relation to armed conflicts is yet to be tackled. In light of the widespread reluctance to encourage any modification of international humanitarian law, it seems likely that any gains that will be made will be in preventative measures before conflicts, and in remedial measures in their wake. Efforts to secure environmental themes at the UN Security Council still face objections from some states, with further initiatives on climate and water security planned or underway. Topics relating to conflict and the environment are increasingly secure in the context of the UN Environment Assembly, and look likely to develop further in future. Elsewhere the ICJ has yet to utilise its new policy mandate on environmental harm, while work to fully secure the principle of environmental human rights is underway. The first draft of the French government’s legal initiative for a Global Pact for the Environment also addresses environmental protection in relation to armed conflicts. Critically, how legal and policy initiatives are implemented is key to their effectiveness in reducing environmental and humanitarian harm. In spite of the considerable gains made thus far, effective implementation of the legal framework remains a persistent challenge.